July 2018 update - Project team is reviewing the 90% design plans and specifications. Design continues to advance. The Pentagon City Metrorail Station is one of the highest ridership Metro stations in northern Virginia. It provides access to multiple retail, government and commercial office buildings and is a transfer point for regional and local transit buses and numerous private bus services. Currently, passengers needing to use a street elevator to access the station must enter or exit on the east side of South Hayes Street. 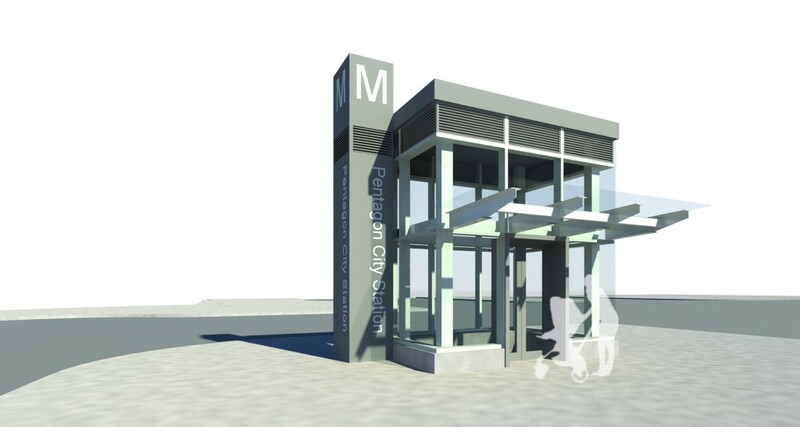 Construction of a second elevator on the west side of South Hayes Street, near the existing west side escalator, will improve access for patrons making transit connections and for Pentagon City retail customers and tourists. It also will provide redundancy for this station entrance when one elevator is out of service for any reason. The project includes improving the appearance of the existing elevator on the east side of South Hayes Street to make it look more contemporary and visible to customers. In 2010 the Washington Metropolitan Area Transit Authority (WMATA) completed, at Arlington’s request, a Feasibility Study of adding an elevator at the Pentagon City Metrorail Station, in anticipation of streetscape enhancements planned in the vicinity. The public will be kept informed as the design process moves forward. The total estimated project cost is $5.1 million. Funding comes from federal and state sources and includes $200,000 in General Obligation bond funds, which are used as a local match for a federal grant.